I have lately had occasion to experiment with gluten-free baking. Namely, the more pregnant I get, the more picky my stomach becomes. I'm not complaining; I've so far had a ridiculously easy pregnancy, so long as I figure out the rules and follow them. 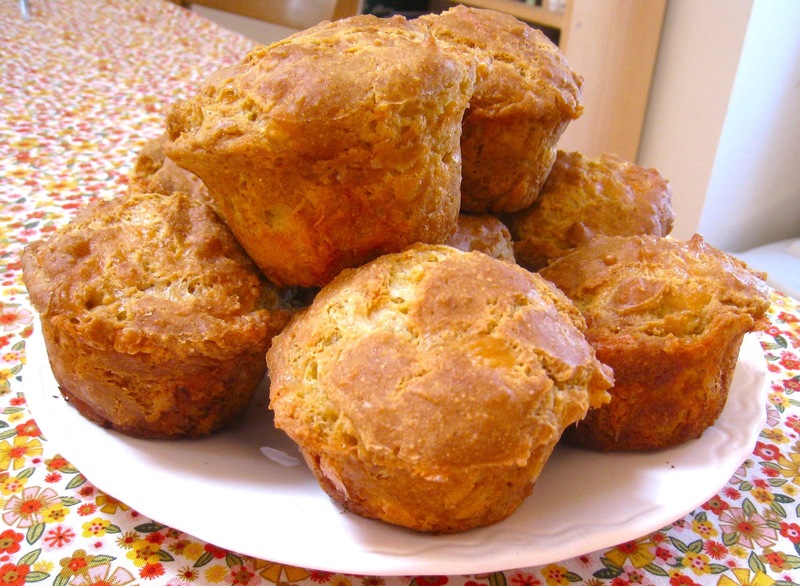 Anyway, these muffins are a bit of a marvel: crusty, buttery, eggy, and all that, but somehow the cheese gives them a very gluten-like springiness and chewiness. It makes sense, I suppose, given that gluten has a texture like cooling melted cheese. Stir everything together. It will seem like way too much cheese at first. Then I take 3 tablespoons of butter and divide it between 9 muffin holes. I use a stoneware muffin pan with muffin holes that are 1.5" deep and 3" across at the top; adjust the number if yours are much different. Pop the pan in the preheated oven for a few minutes to melt the butter. Scoop the muffin batter into the melted-butter-filled muffin holes. The batter will come up about level with the top of the pan. Bake 30 minutes. Remove from the pan to cool. The melted butter in the pan makes the muffins so nice and crusty! These would also be delicious with some fresh herbs minced in, like chives or rosemary.